At first, to make a stand for displaying photographs sounds like an easy job. You weld few pieces together, paint them, glue the prints to them... But in fact, just the design means hours of hard work, trying and testing. The stand for example must have the right proportions to be visually pleasing. It must have an excellent stability and strength so that it can be used in the exterior. At the same time, it has to be simple enough so that it can be taken apart and transported. And that’s just a fraction of what we dealt with when we were developing the stands. 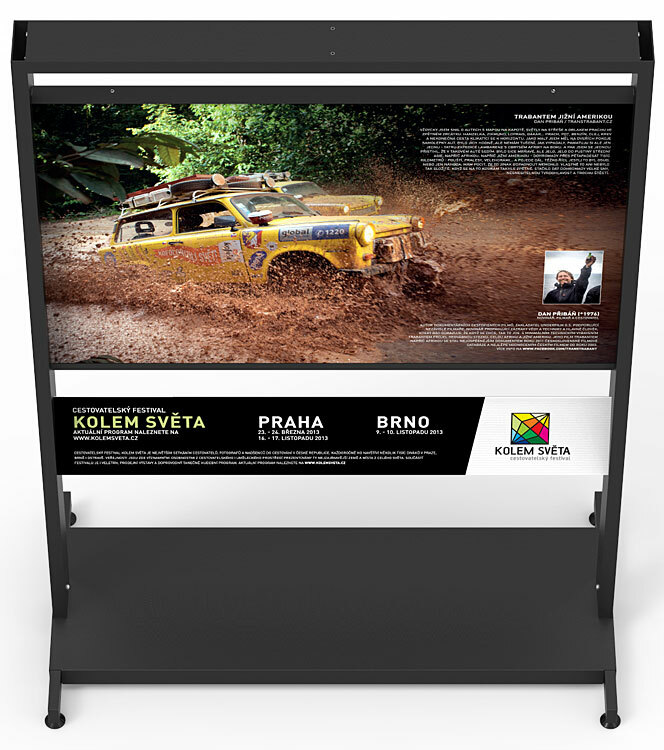 Every stand contains two 1500 by 1000 mm boards (3 mm thick) which serve as a foundation for the photographs. These boards are attached with slats to the aluminum frame which also supports and strengthens the construction of the stand. The slats holding boards can be, if needed, attached with security screws that cannot be removed without special tools. The boards consist of two layers of 0.3 mm thick aluminum slabs with a polyethylen core. Thanks to this composition, the boards are strong, stable and resistant to all kinds of weather. The piece which carries the description is made of 2 mm thick aluminum sheet. It can carry the description of the displayed slide, advertisement, logos, promotion and so on. As it is also attached to the frame of the stand, its other function is to strengthen the construction of the stand. Every detail has a meaning. The stands we offer at the present are marked as v5 (version 5). It means that it’s already the fifth generation of the stands. It’s almost unbelievable how much you can improve on an ordinary stand made of few pieces. There’s always something you can do better. For the purpose of development we use professional CAD software and 3D visualization as well as experience from practice. 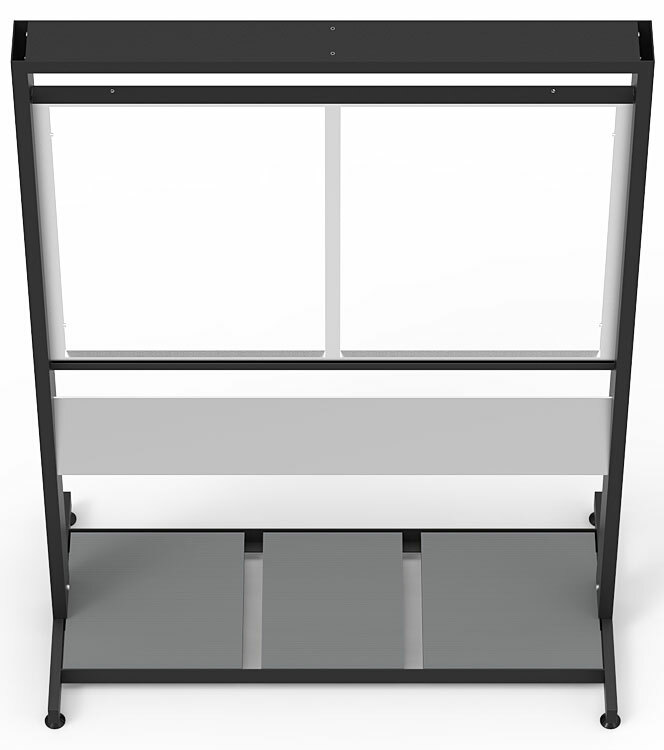 We want our stands not only to have a perfect design, but also to be easy to take apart and transport. We use top-notch technologies to make the stands such as CNC bending, or precise waterjet cutting. We offer only excellent quality proved in practice. To offer them for sale we decided only after we developed and tested four generations of the stands. Poznámky * Krycí lišty mohou být na přání dodány s bezpečnostními šrouby vyžadujícími speciální nářadí pro jejich demontáž. ** Osvětlení fotografií není standardní součástí stojanu. Musí být objednáno zvlášť. *** Závaží je nutné prouze pro realizace výstav v exteriéru. The exhibition of 20 large scale photographs displayed on 10 stands takes up an area of at least 40 square meters. It’s quite an exhibition... But still you can take it apart and store it in a small garage and transport it in a regular van. It won’t probably surprise you if we tell you that we measured and tried all kinds of commonly available vans. We try to think of every detail. Do you need the stands just for short period of time?